Corporate Social Responsibility (CSR) at AGI has evolved to include the participation of all stakeholders: students, faculty, non-government organizations (NGOs), and the local community. Over the years, students and faculty at AGI have actively participated in outreach program initiatives where they contribute knowledge, skills and technical expertise to the community. At the same time, AGI has enthusiastically supported the program activities of several NGOs operating in the community. Magnanimity redefined – Charity begins at College. It can be said that blood is that magic potion which gives life to another person. Though we have made tremendous discoveries and inventions in Science we are not yet able to make the magic potion called Blood. Human blood has no substitute. 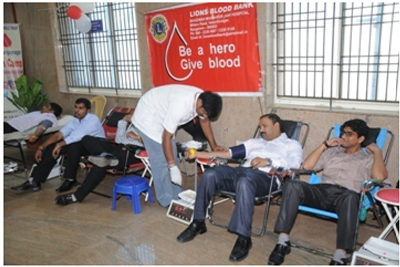 Requirement of safe blood is mounting and regular voluntary blood donations are imperative for blood transfusion services. 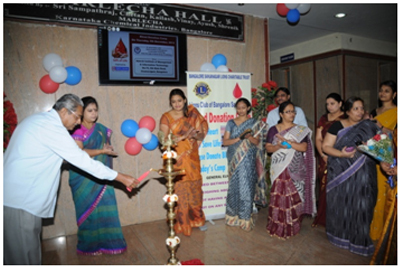 Adarsh Group of Institutions, in collaboration with LIONS Club, Sanjaynagar, and HDFC bank conducted a Blood Donation drive on the 4th of Dec-2013 in their college campus located at Chamrajpet. 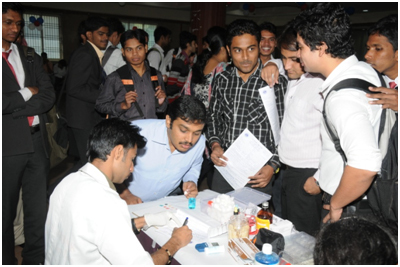 The campus was teaming with students, supremely enthusiastic about the event. It was heartening to see how passionate and fervent our youngsters are, to donate to a noble cause. Their magnanimity was indeed a delight to watch.